Yes, children’s golf lessons return to Roaring River Golf Course, near Belmopan every Wednesday from 4pm – 5pm. After the success of the golf lessons from March – June 2011 we will be resuming lessons for the children on September 28th. Last year the Belize Amateur Golf Association (BAGA), headed by Andy Hunt and Mickey Thornton, completed 15 weeks of lessons, culminating in the first Belize Junior Golf Championship. We are improving on the program this year with better equipment and more competitions. Our sponsor Gobie Challenge has given us funds to provide better equipment including 9 new sets of clubs, 600 practice range balls and golf gloves for the children. If anyone wishes to get involved with this successful program please contact us. Sponsors are vital to the improvement in what we offer the children. In November we will have a golf professional from USA, coming to Belize to provide expert tuition for the kids. It is only $5 per child/lesson which includes snacks, drinks and equipment. See you there. Pick up can be arranged at either Westar or Garbutt Gas Station in Roaring Creek at 3.15pm. Drop off at Westar Gas Station at 5.30pm. Contact Andy Hunt on 651 9929 or Email us at bagabze@gmail.com for more information. NOTE : NUMBERS ARE LIMITED SO CONTACT ME TO RESERVE YOUR CHILDS PLACE IN THE PROGRAM. 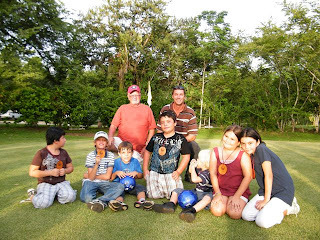 Click to see 2010 Belize Junior Golf Championship.